Dr. Zakarian received his Doctoral Degree in Chemistry in 2001 in the field of natural products synthesis, working in the group of Professor Robert Holton. He subsequently pursued his postdoctoral studies at the University of California, Irvine in the laboratories of Professor Larry Overman, between 2002 and 2004. After first four years in Florida, Dr. Zakarian joined the faculty at UC Santa Barbara in June 2008. He is a recipient of the Amgen Young Investigator Award, Eli Lilly Grantee Award, and the NSF Faculty Early Career Development Award. 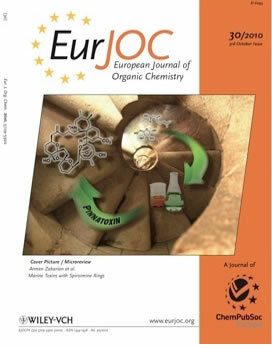 In our research, we are applying our core interest in the synthesis of complex natural products as a starting point to contributions in different fields of chemical science, including the development of organic synthesis on both strategic and methodological levels, asymmetric synthesis, development and applications of catalysis, and various aspects of bioorganic chemistry, especially the elucidation of the mode of action of unusual biologically active natural products. As an example, in the past few years our efforts have focused on a subclass of marine toxins belonging to the cyclic imine group. We have achieved a scalable synthesis of one member in this class of complex natural products that enabled the elucidation of its mechanism of toxicity in collaboration with a research group in France. This research project also served as a starting point for our contributions to the development of new methodology based on enolate chemistry, which is an ongoing effort in our group. Beaumont, S.; Ilardi, E. A.; Tappin, N. D. C., Zakarian, A. “Marine Toxins With Spiroimine Rings: Total Synthesis of Pinnatoxin A” Eur. J. Org. Chem. 2010, 5743–5765. Gu, Z.; Zakarian, A. “Total Synthesis of Rhazinilam: Axial-to-Point Chirality Transfer in an Enantiospecific Pd-Catalyzed Transannular Cyclization” Org. Lett. 2010, 12, 4224–4227. Herrmann, A. T.; Saito, T.; Stivala, C.; Tom, J.; Zakarian, A. “Regio- and Stereocontrol in the Rhenium-Catalyzed Transpositions of Allylic Alcohols” J. Am. Chem. Soc. 2010, 132, 5962–5963. Lu, C.-D.; Zakarian, A. “Unified Total Synthesis of (±)-Trichodermamide B and the Putative Biosynthetic Precursor of (±)-Aspergillazine A Using the Oxaza-Cope Rearrangement” Angewandte Chemie, Int. Ed. 2008, 47, 6829–6831. Stivala, C.; Zakarian, A. “Total Synthesis of (+)-Pinnatoxin A” J. Am. Chem. Soc. 2008, 130, 3774–3776. Ilardi, E. A.; Stivala, C. E.; Zakarian, A. "Hexafluoroisopropanol as a Unique Solvent for Stereoselective Iododesilylation" Org. Lett. 2008, 10, 1727-1730. Stivala, C.; Zakarian, A. "Total Synthesis of (+)-Pinnatoxin A" J. Am. Chem. Soc. 2008, 130, 3774-3776. Qin, Y.; Stivala, C. E., Zakarian, A. "Acyclic Stereocontrol in the Ireland-Claisen Rearrangement of alpha-Branched Esters" Angewandte Chemie, Int. Ed. 2007, 46, 7466-7469. Zakarian, A.; Lu, C.-D. "Development of the 1,2-Oxaza-Cope Rearrangement" J. Am. Chem. Soc. 2006, 128, 5356-5357.